Have you cottoned on yet? That’s the question Peter Melchett, policy director of the Soil Association, asked textile-industry leaders at the Sustainable Textiles Conference in Hong Kong on Wednesday. Echoing the slogan of the U.K. nonprofit’s latest campaign, which it launched in partnership with the Global Organic Textile Standard, Melchett urged manufacturers and retailers to address the economic and social damage associated with conventional cotton farming and processing. Up to 80 percent of the world’s cotton currently comes from genetically modified crops, according to the “Have You Cottoned On Yet” initiative, the first of its kind to promote organic cotton on a global scale. In India, the world’s second-biggest cotton producer, 95 percent of seed is controlled by a single company: Monsanto. Demand for cotton increases every year, the campaign notes in its briefing paper, yet the price tag for its production is rarely felt by the consumer. Instead, the social, environmental and economic costs are felt in the fields, by the farmers and families that produce it. Although worldwide demand for organic cotton is set to grow by at least 10 percent over the next year, many brands opt for easier but less effective sustainability schemes, or worse, do nothing at all. Bt cotton, a breed of cotton genetically modified with insecticidal toxins from the Bacillus thuringiensis bacterium, is the only GM crop that has been widely commercialized in developing countries. Yet it’s hardly the silver bullet against poverty and hunger that GM companies have claimed. Cotton is a toxic crop. Although it occupies just 2.5 percent of agricultural land, it consumes 7 percent of all pesticides—and 16 percent of total insecticides—used in farming globally each year. Up to 77 million cotton workers suffer poisoning from pesticides every year. Up to 77 million cotton workers suffer poisoning from pesticides every year. Because organic principles require farmers to grow a diversity of crops to maintain healthy and fertile soils and ward off pests, these crops often double as a source of food, enabling farmers and their families to feed themselves year-round. As one of the thirstiest crops on the planet, cotton uses and average of 11,000 liters of water for every kilogram of cotton produced. 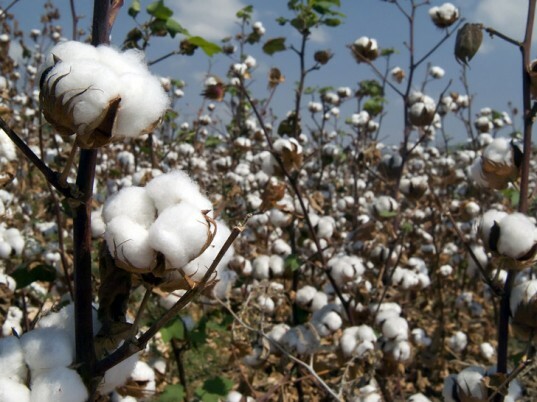 Most cotton is irrigated, draining groundwater, lakes, and rivers while threatening ecosystems, wildlife, and water availability for other humans needs. Organic cotton, which is primarily rain-fed, helps preserve vital groundwater stores. Organic cotton is primarily rain-fed, which helps preserve vital groundwater stores. Organic production also results in healthier soils, which are better at holding onto and soaking up water that comes from rain or irrigation. “Organic soils make better use of water inputs and are more resilient in drought conditions,” the campaign says. By eliminating the use of manufactured fertilizers and pesticides, as well as reducing nitrogen inputs, cotton farming produces up to 94 percent less greenhouse gases, according to the Soil Association and GOTS. Plus, organic techniques turn soils into carbon “sinks,” which helps remove carbon dioxide from the atmosphere. 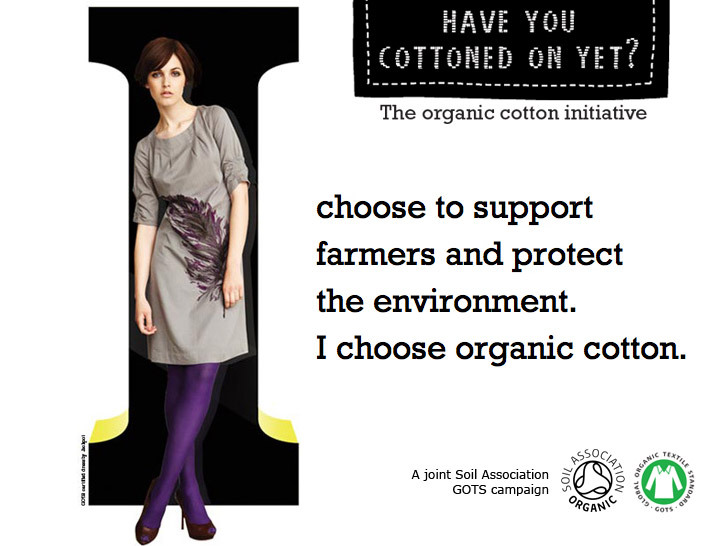 Have you cottoned on yet? That's the question Peter Melchett, policy director of the Soil Association, asked textile-industry leaders at the Sustainable Textiles Conference in Hong Kong on Wednesday. Echoing the slogan of the U.K. nonprofit's latest campaign, which it launched in partnership with the Global Organic Textile Standard, Melchett urged manufacturers and retailers to address the economic and social damage associated with conventional cotton farming and processing. Up to 80 percent of the world's cotton currently comes from genetically modified crops, according to the "Have You Cottoned On Yet" initiative, the first of its kind to promote organic cotton on a global scale. In India, the world's second-biggest cotton producer, 95 percent of seed is controlled by a single company: Monsanto.